JEE Main Results 2017 : JEE Main Result 2017 will be announced on April 27, 2017 on the official website jeemain.nic.in. Candidates can download score and all india rank after the official availability of the Result from JEE Main website. 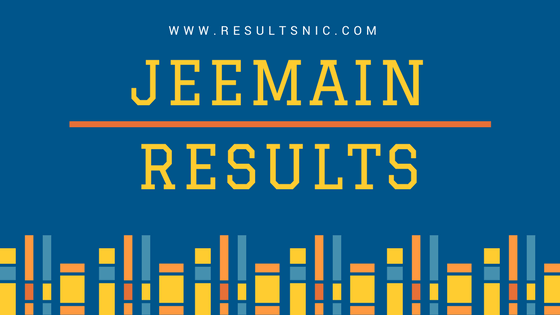 Paper I of JEE Main 2017 results are available on jeemain.nic.in. The JEE main score comes with the actual marks obtained in Paper I. Also the qualification status for attending the JEE Advanced 2017.The rank shall comprise All India rank and All India category rank. 2,20,000 candidates appeared for JEE Main Examination in 2017. CBSE released the answer key for JEE Main after the 9th April 2017. CBSE accepted objections against answer key before 22nd of April. The Joint Entrance Examination (JEE) Main Examination is the National level entrance examination organised by CBSE every year. Students seeking admission in BE/B.Tech, B.Arch/ B.Pharmacy courses in IITs, NITs, CFTIs are appearing in JEE Main Examination. The JEE Main All India Rank (AIR) will also be announced by CBSE at the time of result declaration. Candidates those have cleared the JEE Main Paper -1 (B.Tech/ BE) examination with appropriate marks are eligible to appear for the JEE Advanced Examination which is going to be held on 21st May 2017. The JEE Advanced Paper 1 will be held from 9 am to 12 pm in the morning and paper 2 will be held from 2 pm to 5 pm in the afternoon. The candidates will also be given the All India Rank (AIR) for JEE Mains 2017 based on the criteria given below. If the candidates is having tie, that is having an equal scores then, 60 percent of the weight will be given to the performance in the examination and 40 percent of the weight of normalized score that is taken from the class 12th or its equivalent exam, merit of the candidates will be given as per the order that has been given by the CBSE board. The students can access all the merit list and rank based on these criteria from the official website of the board. 1.The percentage of marks and percentile are totally different entitieshence the candidates should not confuse with both the above terms. 2. Percentage is a number out of 100. 3. Percentile Scoreof a candidate in a Board will reflecthow many Candidates have scored below that candidatein his/her Board Examination. A Percentile score is the value below which a certain percent of observations fall. For example, the 40th Percentile is the value or score below which 40 Percent of the observations may be found.